The overall production on the album seems a bit too clinical and the drum sound as well as some of the drumming itself seem a bit to rigid and straightforward. If only Martin Birch had produced…if only Cozy was playing…. ‘Wolf To The Moon’ is a good opener with an intricate riff and some interesting slide guitar, along with a Bach inspired guitar solo. White’s voice is strong and it’s a good song – definitely Blackmore in style. The chord progressions sound vaguely familiar…can’t quite place it yet! 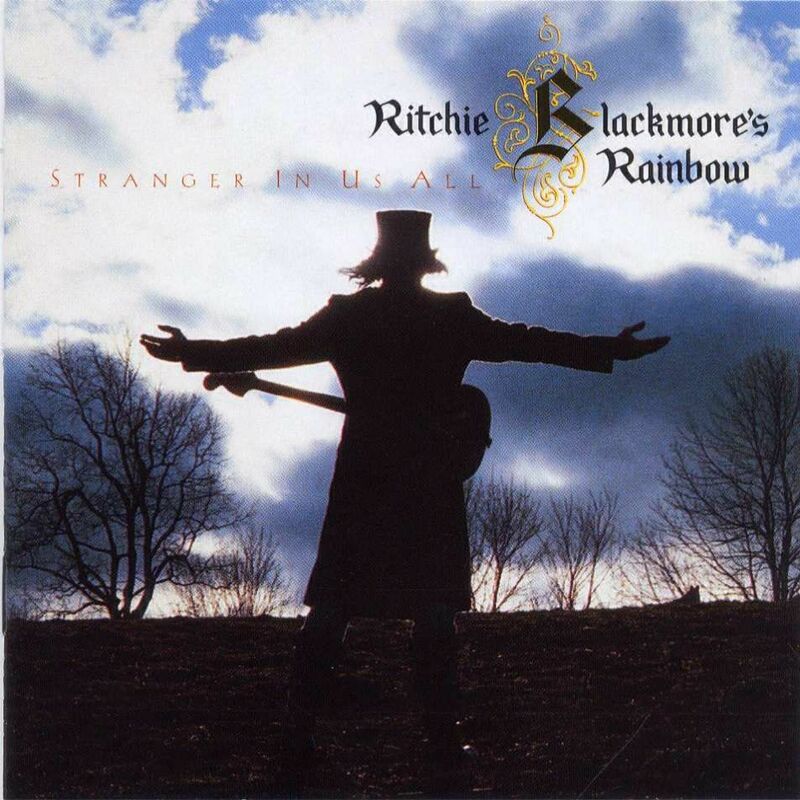 ‘Cold Hearted Woman’ is another strong riff-laden track, but again the bridge leading into the chorus sounds familiar, is it ‘Self Portrait’ from ‘Ritchie Blackmore’s Rainbow’…? ‘Hunting Humans’ is different altogether and is much more interesting and original-sounding in several ways. An eerie double-tracked vocal treatment from White, spooky quitar string scraping, very moody and atmospheric. It’s also a slower tempo than we normally get from Blackmore. Excellent track. According to Doogie White, the song is about the serial killer Dennis Nilson who hunted and killed 17 people as well as resorting to cannibalism…! Nice! ‘Stand And Fight’ is a quite average album filler, straight forward rocker that again sounds like it’s been done a thousand times before. ‘Ariel’ has got to be the standout track on the album and one of the best things Blackmore has ever done. Nice key change early on in the song. An instant classic. ‘Too Late For Tears’ is rather too familiar for it’s own good! Surely this is ‘Can’t Happen Here’ shamelessly reworked?! ‘Black Masquerade’ is much better than the previous track and again much more what we should expect from Blackmore’s talents. Another standout track on the album with part of the lyric giving rise to the album title. Fabulous melodic riff and superb acoustic guitar solo, obviously hinting at what was to come next in the varied career of Mr Blackmore…but at least he lets rip with another excellent solo, this time on the Strat’. ‘Silence’ is very reminiscent of the kind of thing he was doing with Purple 10 years earlier and one can imagine Gillan singing the exact same vocal. Although the harmony vocal is closer to Coverdale/Hughes on ‘You Fool No One’. Disappointingly average. 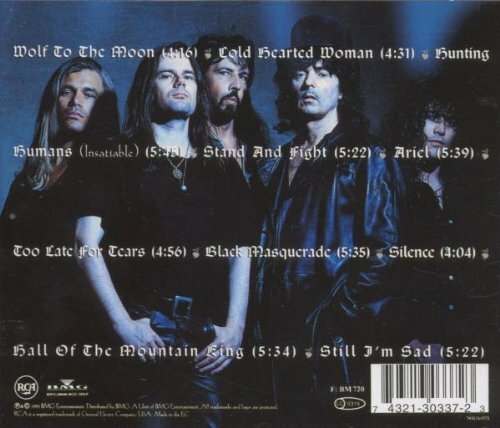 ‘Hall Of The Mountain King’, is probably a little predictable but nevertheless, it doesn’t fail to deliver with excellent guitar work and a strong vocal. Excellent key change ending and increased tempo although it feels as though it could have gone just a little faster before it ends. Great tune though. ‘Still I’m Sad‘ features a superb intro from Blackmore which is sadly let down a little by the subsequent lacklustre arrangement of the remainder of the song. Although the chorus is a little more faithful to the original Yardbirds version, the Dio-era live version of this classic had so much more energy and dynamics and is still the superior one in every respect. Drummer John O’Reilly was replaced for the first live dates by former Rainbow drummer Chuck Bürgi, who was also later replaced by John Miceli for the USA tour in 1997. Despite everything this is still a great rock album. And Doogie is a really good singer!